A page on Varanasi in North India which is one of the seven holy cities. Discover the holy land of the Hindus, the prime pilgrimage destination and tourist hot spot. Varanasi also called Benaras is situated on the banks of India's holiest river the Ganges. It is the oldest civilization in India and perhaps one of the oldest cities in the World. The destination is a pilgrimage center and the river Ganges offers salvation to those who are cremated in its folds. Varanasi is much visited by foreign tourists who arrive here in thousands from many countries. They arrive here on spiritual quest and to understand Hinduism. This they do by witnessing rites and rituals and by discourses with the Hindu Holy men or the Sadhus. The city is noted for its ghats or stepped embankments on Ganges and multitude of temples. The Ganges emerges from the towering heights of Himalayas in Northern India. From the Northern Heights it descends to the plains and eventually submerges with Bay of Bengal in Bangladesh. Considered as the holiest river in India the shores are a major pilgrimage centers. Hindu worship many rivers as Mother Goddess but the Ganges attains the highest status. The origin of the holy river is at Devprayag where Alaknanda and Bhagirathi Rivers intermingle. At more than 12000 MSL Gaumukh and Khatling Glaciers are the origin of these rivers. At Devaprayag the confluence create Ganges which flows down nurturing many cities and settlements. Some of the popular places on the banks of this river are Haridwar, Rishikesh, Farkkubad, Kannauj, Kanpur, Kolkatta, Allahbad and Varanasi. The last two are very important as pilgrimage centers while the former two top as long distance pilgrimage venues. The stepped embankment at Ghats of Varanasi are places for worship. Numerous Sadhus or holy men perform rites and rituals for visiting pilgrimages. Bathing at Ganges is considered as a pious act of extreme importance. Worshiping of deceased elder is also an important Hindu ritual. The prayers are performed by the holy men. Along with rituals a vast variety of hymns, songs and prayers are performed on the ghats. The most important bath of one's life takes place at Ganga Banks. This absolves one of past sins and misdeeds. The bath is performed on many occasions as per the Hindu Calender. Pilgrims come from far and wide to perform this important ritual. The holy dip has greater significance on many occasions. This is an important event after a prayer/bhajan session that takes place in the evening. A group of pujaris perform this mass prayer. The session is scheduled in the evening. The prayers are performed using fire in a metal container or plate of copper or brass etc. The fire is created using clarified butter on a thick wick supported by kneaded flour. This is a Vedic fire ritual called homa. This is a an ode to Lord using the elements of fire, water, air, earth and ether. A large number of people partake in Maha Aarti and procession. For tourists this is an interesting event worthy of being described as spectacle. To die at Ganges is considered a sacred event that takes one right to the heaven. This belief is based on the fact that Ganges descended unto earth from heaven. Hence to meet one's end and be cremated here means ascent to heaven. Ganges transgresses netherland, heaven and earth, hence shi is trilok path gamini or one who travels betwixt three worlds. Instant salvation is attained whence a deceased is cremated at Ganges else on can also attain by having his ashes immersed in the holy river. Varanasi a sacred town of Hindus is renowned for its temples which are spread all over the city more so at its ghats. It is situated in the Indian State of Uttar Pradesh in North. Ghats or stepped embankments are special feature of this holy city. 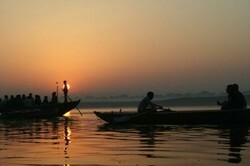 They are situated all over the rivers around Varanasi. The Maratahas were the most prominent rulers to build ghats and temples in and around the city.The ghats are usually of two types: for bathing and for cremation. There are eighty four such stepped embankments here. Varanasi is rich in architectural splendor with numerous temples, palaces and forts. The ancient cradle of civilization holds forth unto modern symbols as well. The city has many palatial hotels, malls, cinemas and restaurants to compete with the modern World. Apart from pilgrims who arrive here in large number many people interested in sightseeing also visit the city. Of these impressive numbers arrive from foreign countries. The interaction with foreign tourists often takes place with the holy men at ghats and the city. The tourists at Varanasi Holy City are on spiritual quests for inner peace. This they do by listening to discourse by Hindu saints, learning meditation, taking part in prayers and Hindu rites and rituals. Apart from seeking inner peace the tourists also come to understand the complexities of ancient Hindu Religion and Vedas. In order to visit the holy city you can join a package tour organized by a tour operators in India.